The highly experienced cosmetic dentists of New Image Dentistry offer bone grafting to patients in the Vancouver WA area. Bone grafting is a highly successful procedure that is a preferred alternative to having missing teeth, diseased teeth, or tooth deformities. This procedure can increase the height or width of the jawbone and fill in voids and defects in the bone. The surgery does not require an overnight stay, and you will be provided with comprehensive instructions for your post-operative care. There are several types of bone grafts. Your dentist will determine the best bone graft material for your particular condition. Autogenous Bone Graft – Harvested from the patient’s own body, usually from the posterior part of the lower jaw or the chin. The bone grafting procedure can often take several months to complete. Typically, bone is harvested from your own body, but on rare occasions, bone is obtained from a bone bank. 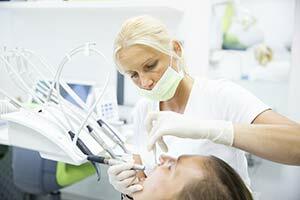 During the surgery, the dentist will numb the grafting and extraction sites using local anesthetic. A small incision will be made to prepare the site for the new bone and it will be anchored into place. This membrane prevents soft tissue and bacterial invasions, and encourages new bone growth. This bone will fuse with the existing bone and the migration of cells will cause firm adhesion and cell growth. Supplementing the jaw with bone will result in greater bone mass to help support and anchor the implant(s). Initially, the dentist will thoroughly examine the affected area in order to assess the general condition of the teeth and gums. The dentist will also recommend panoramic x-rays in order to assess the precise depth and width of the existing bone. On occasion, a CAT scan may be recommended to determine the bone condition. Depending on these results, the dentist may also anesthetize the area and explore into the gum in order to determine what kind and how much bone is required. Bone grafting is often closely associated with dental restorations such as bridge work and dental implants. When the jawbone has receded or sustained significant damage, the implant(s) cannot be supported on this unstable foundation and bone grafting is usually recommended for the ensuing restoration.